A couple weeks ago, I covered the First World War in my American History, and Western Civilization courses. The First World War has always been an event that has obsessed me, and I really love to teach it since Americans generally know very little about it. Since these are introductory courses, I usually portray the war as a definitive cataclysmic event that left enduring scars on the twentieth century. This standard narrative of the conflict draws a line between the Victorian, 19th century world, and the modern, 20th century world. The old world died in 1914. A new world was born in 1918. Historians now realize that this evident war euphoria didn’t infect everyone. 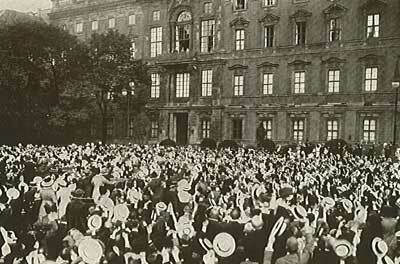 Many Europeans were nervous, anxious, dreadful or apathetic about the outbreak of war. 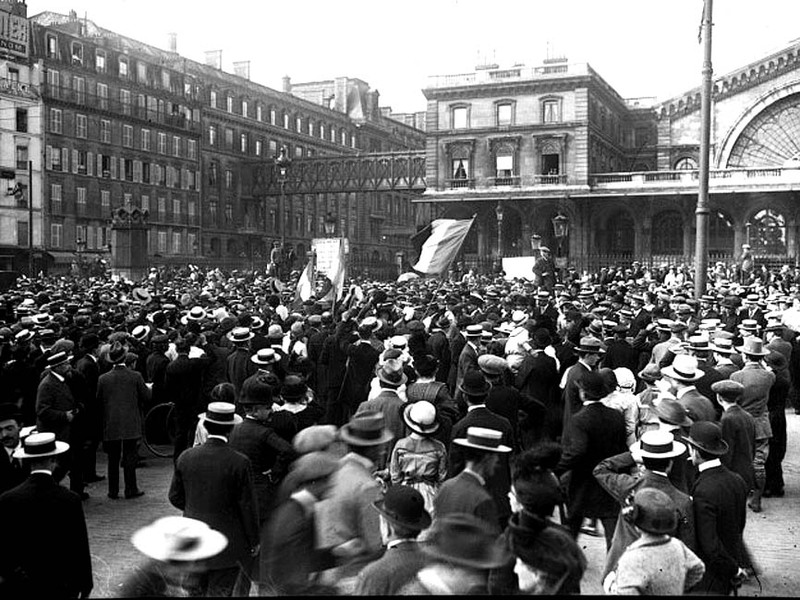 However, there is no denying that the thousands of people in these photos are revved up for what they believed would be their nation’s inevitable victory (each national community felt they would win victory quickly, and cleanly.) These photos make the informed student crack an ironic smile, since he/she knows that the next four years of war would be anything but quick and clean. The young men were cheering their generation’s death sentence. The First World War killed 9 million soldiers, made empires fall, and still is the epitomizing symbol of the absurdity and destructiveness of modern conflict. For 21st century Americans, even those knowledgeable of WWI, the fact that people would be cheering for the outbreak of war is absurd. War in our world is not something to cheer; it may be unavoidable, but any self-respecting American will solemnly swear that ‘war is hell,’ and it should be avoided at all costs. We are more likely to see people in the street, shouting for the end of wars, than cheering for the outbreak of war. 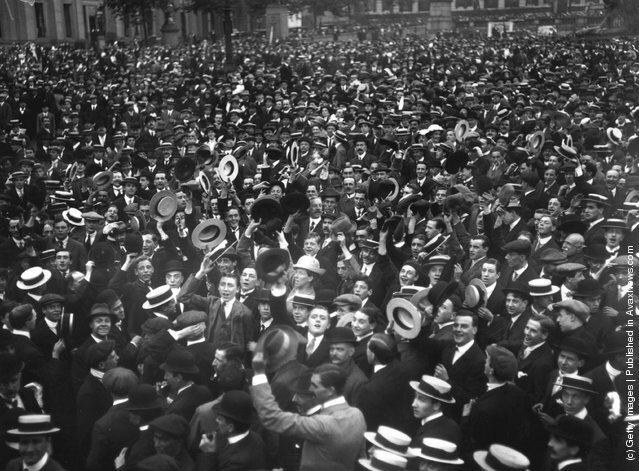 So, why were these people in 1914 so excited? Why would they want war? When I asked these questions a couple weeks ago, I got a familiar answer from my classes. 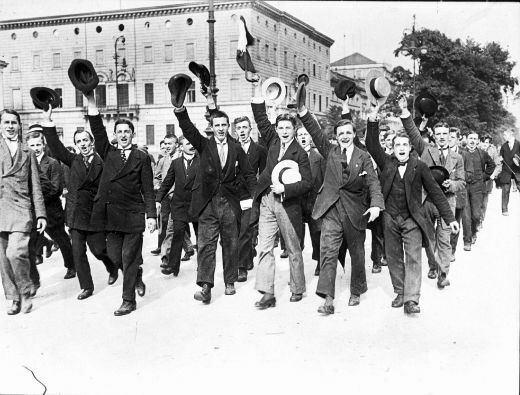 Like some in previous classes, one student shouted out that people want war because it is “good for the economy.” In response, I politely pointed out that these people were not cheering for an economic windfall. After a couple minutes of thinking, and some hints from me, my students gave responses closer to the truth. They realized that these men had lofty expectations for the war. War was thought to provide glory. War could produce honor. War created adventure, and the opportunity for true manliness. Many cheered for war simply following their friends, trying not to be left out. Some believed fighting the war was their duty. Most felt the war was necessary to protect their families from enemies. So, why does it take my students some time to come up with these answers? Why is ‘the economy’ often the first response I get? Simply put, my students are 21st century Americans, and many have the typical worldview that goes along with that identity. Since their youth, they have been inundated with a simplistic materialist ideology that points to the national economy as the most important social issue. How could they not think that economics make the world go round, since media, pop culture and schools have constantly reinforced this belief. As a result, they often misinterpret human motivations as misinformed psychologists, thinking that people make all their decisions as if they were homo economicus. It is my job to try to dispel such beliefs, because the notion that human beings live and die for the strength of an economy has dire consequences for our understanding of the past and present. The human story is not always based upon the direction of the Dow Jones Industrial. MSJ, I swear reading your post is always like you are reading my mind. I struggle to hold back my frustration with my peers when their answers are only surface deep and based purely on media bias. Thanks Blake; I do want to make clear I am not that frustrated with students though. The power of ‘the economy’ as a idea is so powerful, that it took me a couple classes of having students respond to my questions in this way to realize how odd it was. In other words, answering why people would go to war with the response “to strengthen the economy” seemed normal enough to even me. I had to step back and think of how strange that answer really was. There is no other time in human history where that answer would seem normal.